Infection with Staphylococcus aureus does not induce long-lived protective immunity for reasons that are not completely understood. Human and murine vaccine studies support a role for Abs in protecting against recurring infections, but S. aureus modulates the B cell response through expression of staphylococcus protein A (SpA), a surface protein that drives polyclonal B cell expansion and induces cell death in the absence of costimulation. In this murine study, we show that SpA altered the fate of plasmablasts and plasma cells (PCs) by enhancing the short-lived extrafollicular response and reducing the pool of bone marrow (BM)-resident long-lived PCs. The absence of long-lived PCs was associated with a rapid decline in Ag-specific class-switched Ab. In contrast, when previously inoculated mice were challenged with an isogenic SpA-deficient S. aureus mutant, cells proliferated in the BM survival niches and sustained long-term Ab titers. The effects of SpA on PC fate were limited to the secondary response, because Ab levels and the formation of B cell memory occurred normally during the primary response in mice inoculated with wild-type or SpA-deficient S. aureus mutant. Thus, failure to establish long-term protective Ab titers against S. aureus was not a consequence of diminished formation of B cell memory; instead, SpA reduced the proliferative capacity of PCs that entered the BM, diminishing the number of cells in the long-lived pool. Staphylococcus aureus is a major cause of hospital- and community-acquired infections and has become more difficult to treat as antibiotic-resistant strains spread (1). S. aureus infections commonly recur without inducing long-term immunity (2) and, despite the success of some vaccine approaches at inducing short-term protection in mouse models, attempts to design a human vaccine have failed (3–5). Studies in humans and mice correlated pre-existing serum Ab and passive immunization with improved clinical and experimental outcomes (6–10). Mutations that reduce Ab production also increase the risk for acquiring S. aureus infections (5). Further, a recent study found that maintenance of Ag-specific Ab during convalescence correlated with reduced recurrence of infection (11). Despite this evidence that B cells can play a role in protection against S. aureus, little is known about the long-term humoral response to S. aureus. Staphylococcus protein A (SpA) is a virulence factor released from S. aureus during normal cell division that allows soluble and processed Ags to activate the immune system (12, 13). SpA activates B cells upon binding the Fab portion of BCRs of the VH3 clan (up to 50% of naive B cells in humans and 5–10% in mice), inducing a robust nonspecific B cell response (14–16). SpA sequesters IgG by binding the Fc portion and interferes with immune complex–mediated Ag presentation and phagocytosis (17, 18). This suggests that the expression of SpA on S. aureus alters the B cell response to infection. Memory B cells and long-lived plasma cells (LLPCs) confer long-term humoral immunity. Serum Ab levels are sustained by LLPCs derived mainly from memory B cells activated during secondary immune responses (19–21). Memory B cells were identified postinfection with viral, parasitic, and bacterial pathogens (22–25), but whether these cells are formed after S. aureus infection has not been directly addressed. Memory B cells reside in an inactive state in secondary lymphoid organs, and upon re-exposure to Ag, rapidly divide into daughter cells or differentiate into Ab-secreting cells (ASCs), which include surface Ig+ dividing plasmablasts (PBs) and the more mature nondividing surface Ig− plasma cells (PCs) (26). Although the majority of PBs and PCs are short-lived, some migrate to survival niches in the bone marrow (BM), proliferate, and mature into LLPCs (19, 21, 27). Niche factors, including APRIL, support PB proliferation and PC differentiation and survival (28–30). LLPCs and their constitutively secreted Abs are recognized as major contributors to protection against bacterial infection (31–33). In mice, LLPCs can survive for the lifetime of an organism, whereas in humans, they can survive for months to decades and are the main source of convalescent serum IgG (20, 34, 35). It remains unclear whether LLPCs are formed after S. aureus infection or whether SpA influences long-term B cell memory or LLPCs. In this study, we show that SpA disrupts the proliferation of PBs in the BM and the subsequent accumulation of LLPCs, while promoting the expansion of short-lived PBs in the spleen. Mice previously inoculated and then challenged with an SpA-deficient S. aureus mutant (Δspa), but not with wild-type (WT) S. aureus, formed LLPCs and maintained serum Abs for ≥12 wk after challenge. The lack of long-term humoral immunity to WT S. aureus was not due to defects in memory B cell formation or activation, because primary inoculation with WT or Δspa induced the formation of germinal centers (GC) and functional memory B cells. Rather, SpA altered the differentiation of ASCs during the secondary response by expanding IgM+ extrafollicular PBs and reducing the proliferative capacity and the expression of the survival receptor CD138 on PBs that entered the BM, thereby diminishing their ability to enter the LLPC pool. C57BL/6 mice were bred and maintained in a specific pathogen–free facility at The University of North Carolina at Chapel Hill, according to Institutional Animal Care and Use Committee standards. At 7–8 wk of age, mice were inoculated s.c. with 1 × 108 CFU of S. aureus RN4220 (Δspa or WT), Newman, or USA300 in 20 μl of 1× PBS. For challenge experiments, 5 wk after primary inoculation, 1 × 106 CFU were delivered i.v. via tail vein injection in 100 μl of 1× PBS. For experiments using (4-hydroxy-3-nitrophenyl)-acetyl hapten–keyhole limpet hemocyanin (NP-KLH), we conjugated NP to KLH at a molar ratio of 20 moles NP/mole KLH (NP20KLH). To immunize mice, 100 μg of NP20KLH was conjugated to alum (Imject) and delivered by i.p. injection. Immunized mice were boosted (i.v.) with 100 μg of soluble NP20KLH. S. aureus RN4220 (Δspa and WT), Newman, and USA300 were grown in brain heart infusion (BHI) broth at 37°C overnight and washed and diluted in 1× PBS for inoculations. CFU were confirmed by plating serial dilutions on BHI plates. Isogenic S. aureus Δspa mutants (Newman and RN4220) were constructed by amplifying ≈1 kb homology fragments flanking spa with primers Spa5′0.1A (5′-CGACTCTAGAGGAAAAACACACTTC-3′) and Spa5′0.1B (5′-TAAGGATCGGGGACAATACCTACACC-3′) for amplification of the 5′ homology fragment and primers Spa3′1A (5′-TACCGAGCTCGAATATCATTTTATCC-3′) and Spa3′1B (5′-CAGTGCAGCGGAATTGCTTGGAGTCC-3′) for amplification of the 3′ homology fragment. The resulting fragments were cloned on either side of a Specr cassette in the Escherichia coli/S. aureus shuttle vector pBT2ts. Allelic exchange was performed as previously described (36) and confirmed by sequence analysis. To confirm spa deletion, genomic DNA was purified from RN4220 WT, RN4220 Δspa::erm, Newman WT, and Newman Δspa::erm. Primers flanking spa were used to amplify across the genomic region around and containing spa and resulted in ≈2.1-kb fragments in WT strains and ≈1.7-kb fragments in strains in which spa was deleted and replaced by erm. The following primers were used for amplification across spa: Spa.2A, 5′-TTACGCAAGTGTGCTGTATTC-3′ and Spa.2B, 5′-AACAAAAGATGTTGCTCGTGC-3′. S. aureus ΔsrrAB mutants in RN4220 and Newman were generated as previously described (36). RNA was purified from log-phase (OD ≈ 1.0) S. aureus by mixing 25 ml of culture with 25 ml of ethanol/acetone (1:1). Samples were incubated at −80°C overnight and centrifuged, and remaining cell pellets were lysed using Lysing Matrix B (MP Biomedicals, Solon, OH) and a bead beater. RNA was purified from lysed cells using the PureLink RNA Mini Kit (Invitrogen, Carlsbad, CA), following the manufacturer’s instructions. Quantitative real-time PCR was carried out using the SensiFAST SYBR & Fluorescein One-Step Kit (Bioline, Taunton, MA), following the manufacturer’s instructions. The S. aureus housekeeping gene rpoD was used to normalize spa transcript among strains. The primers for rpoD were: rpoD_RT1.A: 5′-AACTGAATCCAAGTGATCTTAGTG-3′ and rpoD_RT1.B: 5′-TCATCACCTTGTTCAATACGTTTG-3′. The primers for spa were: spa_RT.1A: 5′-GTAGGTATTGCATCTGTAAC-3′ and spa_RT.1B: 5′-TTGAGCTTCATCGTGTTGCGC-3′. To assess the bacterial load in kidneys, 7–8-wk-old C57BL/6 mice were infected (i.v.) with 1 × 106 CFU of S. aureus Newman or RN4220 WT, Δspa, or ΔsrrAB. Kidneys were harvested 5, 7, or 14 d later. Kidneys were homogenized in 1× PBS, and serial dilutions of homogenate were plated on BHI. CFU were counted after overnight incubation at 37°C. For S. aureus ELISAs, vinyl plates were coated overnight at 4°C with S. aureus RN4220 Δspa grown to stationary phase, washed, and diluted 1:10 in 1× PBS. Plates were blocked with 0.5% BSA overnight at 4°C. Samples were loaded in 0.5% BSA and incubated overnight at 4°C, incubated with anti-IgG, anti-IgG2, or anti-IgM conjugated to alkaline phosphatase for 1 h at 37°C, and developed with p-nitrophenyl phosphate. For IsdB ELISAs, polystyrene plates were coated with 3 μg/ml IsdB (AA40-614) in carbonate buffer overnight at 4°C and blocked in 0.5% BSA for 1 h at 37°C. Plates were loaded and developed as for whole S. aureus ELISAs. For ClfA ELISAs, polyvinyl plates were coated with 10 μg/ml ClfA in PBS overnight at 4°C and blocked in 0.5% BSA for 1 h at 37°C. Plates were loaded and developed as for whole S. aureus ELISAs. GFP-expressing RN4220 was incubated with heat-inactivated sera (1% of total reaction) for 10 min at room temperature and then incubated with RAW 264.7 macrophages (MFs) at a ratio of 1:15 with rotation at 37°C for 20 min. After incubation, MFs were treated with trypsin, washed with cold PBS, and fixed in 4% paraformaldehyde. The mean fluorescent intensity (MFI) of GFP in each sample was determined by flow cytometry. Spleens or lymph nodes were crushed into single-cell suspensions in cold 1× PBS. BM cells were harvested from femurs by flushing with 1× PBS. Cells were washed, and RBCs were lysed with 0.165 M NH4Cl. To identify dead cells and block Fc receptors before Ab staining, 106 cells were incubated with Pacific Orange Live/Dead stain (Invitrogen/Life Technologies) and 2.4G2 (grown from hybridoma). Lymphocytes and monocytes were identified by forward and side scatter profiles. GC B cells were identified as CD19+ GL7+ FAS+, T follicular helper cells were identified as CD4+ PD-1+ CXCR5+, ASCs were identified as CD138+ B220lo/neg, dendritic cells (DCs) were identified as CD11chi CD19− CD3− CD49b− Ter119− and CD8α+ or CD8α−, plasmacytoid DCs were identified as CD11c+ CD19− CD3− CD49b− Ter119− CD45RA+, and eosinophils were identified as Siglec-F+ CD11bint. For intracellular cytokine analysis, cells were fixed and permeabilized (BD Biosciences) overnight at 4°C before staining. For intracellular IL-12, cells were incubated for 3 h at 37°C with 3 μg/ml brefeldin A before fixing. For chemokine receptor analysis, cells were labeled in azide-free buffer at 37°C and then washed in normal buffer on ice to halt recycling. Data for DC analyses were collected on a Becton Dickinson LSR II and analyzed with FlowJo software. All other samples were run on a Beckman Coulter CyAn ADP and analyzed with Dako Summit. Abs specific for CD19, CD3e, CD4, PD-1, APRIL, CD11c, IL-12p40, Ter119, CD11c, MHCII IA/IE, and TACI were purchased from BioLegend. GL7, FAS, CXCR5, CD138, B220, IgG, Siglec, CD19, CD8, CD45RA, annexin V, and streptavidin-HRP were purchased from BD Biosciences. GR-1, CXCR4, CD3e, CD49b, CD40, CD86, and CD80 were purchased from eBioscience. BCMA was purchased from R&D Systems. IgM (B7.6) and anti-Fc (2.4G2) were purified from hybridomas. Live/Dead Pacific Orange, Fixable Blue dyes, anti-IgG–alkaline phosphatase, anti-IgM–alkaline phosphatase, and streptavidin were purchased from Invitrogen/Life Technologies. SDF-1 was purchased from Shenandoah Biotechnology; anti-IgG2– alkaline phosphatase from SouthernBiotech; p-nitrophenyl phosphate tablets, 3-amino-9-ethylcarbazole tablets, peanut agglutinin-biotin, and LPS from Sigma; anti-IgG Fc from Jackson ImmunoResearch; and Brefeldin A from LC Laboratories. IsdB peptide (AA 40-613) was a gift from Dr. Benfang Lei (Montana State University). Pokeweed mitogen (PWM) was a gift from Dr. Shane Crotty (La Jolla Institute for Allergy and Immunology). GFP-expressing RN4220 was a gift from Alexander Horswill (University of Iowa Carver College of Medicine). Multiscreen ELISPOT plates were coated with 1.5 μg/ml IsdB (AA40-613) or NP13BSA in 1× PBS overnight at 4°C and blocked in 1% BSA overnight at 4°C. Single-cell suspensions of RBC-lysed splenocytes or BM cells were plated at 0.5–2 × 106 cells per well for 18 h, and spots were developed with anti-IgG or IgM, as previously described (37). RBCs were lysed from single-cell suspensions of spleens and lymph nodes. Cells were plated at 0.5 × 106 cells per milliliter with equal numbers of irradiated (1200 rad) feeder cells, and LPS at 5 mg/ml LPS. Fixed S. aureus was added to the culture at a 10,000:1 or 1,000:1 ratio (bacteria/cells) and then incubated for 5 d at 37°C. After 5 d, cells were washed and plated in serial densities (0.25–2 × 106 cells per well) on IsdB-coated ELISPOT plates and developed as above. Spleens were fixed in 4% paraformaldehyde for 5 h at room temperature, washed with PBS, hardened in 30% sucrose overnight, and washed and flash frozen in OCT (Tissue-Tek). Sections (6 μm) were fixed in 1:1 MeOH/acetone and blocked in 0.5% rat serum and 2.4G2 before staining for B220–Alexa Fluor 647 and IgM-biotin/Alexa Fluor 488 Streptavidin to detect extrafollicular foci. To detect GCs, fixed sections were blocked in 10% FBS and 2.4G2 and stained with B220–Alexa Fluor 647 and peanut agglutinin-biotin/Alexa Fluor 488 Streptavidin. Sections were imaged with an Olympus Fluoview 500 (10× objective; numerical aperture of 0.45) and analyzed using ImageJ software. Splenic B cells were purified by negative selection (STEMCELL Technologies), and 5 × 106 cells were plated in the top chamber in a 5-μm Transwell insert (Corning). For control wells, cells were plated in the bottom chamber with no insert. CXCL12/SDF-1 (100 ng/ml) was added to the bottom chambers, and plates were incubated for 3 h at 37°C. Samples from the bottom and control wells were harvested and labeled with CD138 and B220 and enumerated by flow cytometry for 120 s per sample. The number of migrated ASCs in the bottom of the Transwell was divided by the number in the corresponding control well and expressed as a percentage of ASCs in the control well. Inoculated and challenged mice were injected (i.p.) with 2 mg of BrdU (Sigma) in PBS on day 10 postchallenge (day 45). After 2 h, BM cells were harvested, and BrdU-labeled ASCs were identified by flow cytometry using a BD Pharmingen BrdU Flow Kit. To assess whether S. aureus induces the formation of LLPCs and whether this is impacted by protein A (SpA), we inoculated mice s.c. with strain RN4220 expressing SpA (WT) or an isogenic spa deletion mutant (Δspa) (Fig. 1A, Supplemental Fig. 1A). We chose s.c. inoculation because clearance of S. aureus could be readily monitored at the injection site within 3 wk. We used the subinfectious strain RN4220, because its low virulence allowed mice to be analyzed over a long period of time without significant weight loss or morbidity, while still inducing a localized skin infection and a S. aureus–specific Ab response. SpA did not change the frequency of B cells in nearby peripheral lymph nodes after s.c. infection (Supplemental Fig. 1B). Total S. aureus–specific serum IgG and IgG2 were detectable between 2 and 5 wk after primary inoculation with S. aureus Δspa (1.5-fold over naive) or WT (2-fold over naive) (Supplemental Fig. 1C, 1D), indicating that our model results in a productive primary B cell response in the presence or absence of SpA. Most LLPCs are derived from PBs and PCs (hereafter referred to collectively as ASCs) that have taken up residence in the BM within 2 wk after activation of memory B cells (19, 20). Therefore, we measured the frequencies of ASCs (defined as CD138+/B220lo/neg) in the BM 35 d after inoculation and periodically for 2 wk following a second i.v. inoculation (referred to as challenge) (Fig. 1A). ASCs appeared in the BM by day 40 (day 5 postchallenge), regardless of whether mice were challenged with WT or Δspa S. aureus; however, after day 45 (day 10 postchallenge) their frequency began to decline in the WT, but not in the Δspa-challenged, mice (Fig. 1B). This was not due to an inability to migrate toward the BM niche, because ASCs that formed after WT challenge migrated through a Transwell membrane toward CXCL12 (Supplemental Fig. 1E) and expressed similar levels of CXCR4 (Supplemental Fig. 1F). The frequencies of total ASCs continued to increase in the BM of Δspa-challenged mice for 2 wk, at which point they were significantly higher than those measured in WT-challenged mice (Fig. 1B). This phenotype was not unique to RN4220, because mice infected and challenged with the clinical strain Newman displayed significantly more BM ASCs 2 wk after challenge with Δspa Newman compared with WT Newman (Fig. 1C). Few ASCs were observed in the BM after primary inoculation (Fig. 1B), consistent with studies showing that higher numbers of BM PCs are formed during secondary responses (20, 38). In contrast to the BM phenotype, the frequency of splenic ASCs on day 40 (day 5 postchallenge) was significantly higher in WT mice compared with Δspa-challenged mice (Fig. 1D). No significant differences were observed after day 42 (day 7 postchallenge), when the frequency of ASC began to decline. Therefore, the presence of SpA in the challenge inoculation enhances the splenic ASC response and simultaneously disrupts the accumulation of ASCs in the BM. IgG Abs specific for the S. aureus cell surface hemoglobin receptor IsdB were detected in infected mice and were studied recently in vaccine trials (39, 40). To compare the numbers of S. aureus–specific ASCs in WT and Δspa-challenged mice, we performed ELISPOTs using IsdB as a target Ag. We observed significantly more IsdB-specific IgG ASCs in the BM of mice challenged with Δspa compared with WT S. aureus (Fig. 1E), indicating that the response is specific to S. aureus. In the spleen, slightly higher numbers of IsdB-specific ASCs were found after WT challenge, although this difference was not statistically significant (Fig. 1F). Together, these data indicate that primary and early secondary S. aureus–specific Ab responses are not quantitatively enhanced in the absence of SpA. These findings are consistent with a previous study (41) but contrary to a study showing that primary i.v. infection with SpA-deleted S. aureus (Newman) enhances the production of Abs to select Ags (42). The significantly higher numbers of IsdB-specific ASCs observed in the BM 14 d after challenge (day 49) compared with 14 d after primary inoculation are consistent with a memory B cell response (Fig. 1E). ASCs that migrate and persist within survival niches in the BM are most often derived from activated memory B cells (19, 43). Therefore, a defect in the early memory responses could have disrupted accumulation of BM ASCs after WT challenge. To test this, we used ELISPOT to detect the numbers of IsdB-specific memory B cells after in vitro polyclonal stimulation. On day 35 postinoculation, ex vivo lymphocytes from the spleens and lymph nodes were activated with PWM. The 6-d culture period is too short to induce class-switch; thus, all Ag-specific IgG-secreting cells detected by ELISPOT are derived from memory B cells (22, 23). We detected significantly greater numbers of memory-derived ASCs in both Δspa- and WT-inoculated mice compared with naive mice, regardless of whether SpA was present (Fig. 2A). Consistent with this, we found that GC B cells, which are required in the formation of high-affinity memory B cells (44), were present after inoculation in the draining lymph nodes and spleen and appeared with similar kinetics in both WT- and Δspa-infected mice (Fig. 2B, 2C). T follicular helper cells, which are required for GC development (45), were also induced at similar frequencies after primary inoculation with S. aureus Δspa or WT (Supplemental Fig. 1G). Memory B cells could be reactivated because secondary IgG2 (IgG2a, 2b, and 2c) responses were more rapid and robust 2 wk postchallenge compared with primary responses to the same stimuli (2–6-fold; Fig. 2C) (46, 47). This increase was also apparent in total IgG (Supplemental Fig. 1H) and was dependent on a previous inoculation, as indicated by the significantly higher levels of IgG2 and IgG compared with primary inoculation (i.v.) of naive mice (Fig. 2D, Supplemental Fig. 1I). In addition, we found that challenge with WT or Δspa S. aureus induced early amnestic IgG responses to IsdB (Fig. 2E), which were also dependent on previous inoculation (Fig. 2F). To ensure that the secondary response was not unique to RN4220, we inoculated and challenged mice with the clinical strains Newman and USA300. We observed enhanced secondary responses similar to those induced by RN4220 (Fig. 2G). Memory to S. aureus was long-lived because mice were able to produce amnestic S. aureus–specific Ab responses (2–3-fold) when challenged 100 d after primary inoculation (Supplemental Fig. 1J). It was shown recently that when SpA is neutralized during infection, mice produce a more diverse Ab repertoire (48). Thus, despite Δspa-challenged mice making fewer total splenic ASCs than WT-challenged mice, it is possible that they developed better Ab diversity, which would enhance ex vivo opsonization. 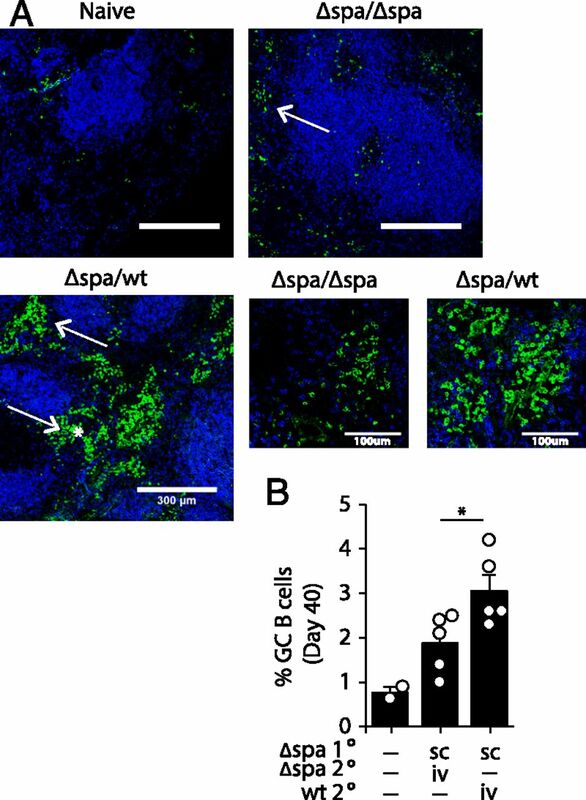 We found that heat-inactivated serum from both Δspa- and WT-challenged mice facilitated phagocytosis of GFP+ S. aureus; however, sera from Δspa-challenged mice resulted in enhanced internalization (Fig. 2H). Together, these data indicate that the lack of accumulation of BM ASCs in WT-challenged mice is not caused by defects in B cell memory formation or the immediate memory response. Rather, inoculation with S. aureus induces memory B cells that respond to challenge by making functional Ab, which is more effective when produced in the absence of SpA. Although mice challenged with WT S. aureus (day 35) made significantly more splenic ASCs (day 40) than did those challenged with Δspa (Fig. 1D), both groups produced similar levels of Abs against S. aureus surface proteins in the first 2 wk after challenge (Fig. 2). WT- and Δspa-challenged mice also displayed similar frequencies of ASCs in the BM for the first 10 d after challenge (Fig. 1B). To understand why splenic ASCs induced during WT challenge did not promote a more robust humoral response, we examined them in greater detail during the peak (day 40) of the secondary ASC response (Fig. 3A). We found that the expansion of ASCs in WT-challenged mice was not due to changes in the frequency of B cells (Supplemental Fig. 2A) but was due to increases in CD138+/B220lo/neg cells (Fig. 3B, 3C). Compared with naive mice given S. aureus as a primary inoculation, mice challenged (i.v.) with WT or Δspa S. aureus had a higher frequency and total number of ASCs (Fig. 3C, Supplemental Fig. 2B) and produced two to three times more IsdB-specific IgG-secreting ASCs compared with naive mice given a primary inoculation on the same day (Fig. 3D). This is consistent with reactivation of memory B cells. In contrast with the frequency of total ASCs, the number of IsdB-specific ASCs was not altered by the presence of SpA, consistent with our findings that short-term secondary IgG responses were similar between WT- and Δspa-challenged mice (Fig. 2). These data suggest that SpA promotes expansion of total ASCs but not ASCs specific for the S. aureus surface Ag IsdB. SpA was identified as a B cell superantigen that binds the VH3 class of BCRs and drives polyclonal B cell expansion and apoptosis (49). Because IgM binds SpA with a higher affinity than IgG (50), we reasoned that if SpA induced the expansion of ASCs by binding Fabs of VH3 BCRs, the ASC population would contain a large fraction of PBs retaining surface IgM. We found that 54% of the ASCs formed after WT challenge were surface IgM–expressing PBs compared with only 30% of ASCs formed after Δspa challenge (Fig. 3E). The frequency of IgG-expressing PBs was not significantly different between the two groups (20.5% of Δspa and 17.8% of WT) (Fig. 3F). These data suggest that most of the surface Ig+ PBs expanded by SpA during WT challenge were IgM+ cells that did not result in greater levels of S. aureus–specific serum IgM or increased numbers of IsdB-specific IgM+ ASCs (Supplemental Fig. 2C, 2D). This is consistent with previous observations that SpA+ S. aureus can drive nonspecific PB proliferation without inducing Ab secretion (51). Because the loss of SpA reduces bacterial virulence and colonization of the kidney (52), it is possible that the reduced expansion of IgM+ PBs during Δspa challenge reflects reduced virulence of the Δspa mutant. S. aureus lacking the virulence factor SrrAB displays a defect in virulence comparable to Δspa (Supplemental Fig. 3A). Loss of srrab did not disrupt expression of spa (Supplemental Fig. 3B), allowing us to test the effect of SpA on the expansion of ASCs and migration to the BM apart from its effects on bacterial burden. We challenged mice with RN4220 WT, Δspa, or ΔsrrAB and found that WT and ΔsrrAB expanded ASCs and IgM+ PBs to levels observed after WT challenge (Supplemental Fig. 3C, 3D). Thus, the lack of expansion of IgM+ PBs in Δspa-challenged mice was not caused by reduced virulence but by the absence of SpA. In models of autoimmunity, sepsis, and chronic inflammation, aberrant expansion of short-lived ASCs was shown to disrupt the establishment and retention of an LLPC population (53–58). We found that accumulation of BM ASCs was defective in mice challenged with ΔsrrAB 14 d earlier (Supplemental Fig. 3E); by 14 d postchallenge, no bacteria were found in the kidneys of mice from any group (data not shown). These data demonstrate that virulence or ongoing infection did not cause the observed defect in BM ASC accumulation after WT challenge. Rather, the absence of SpA reduces the expansion of extrafollicular IgM+ PBs and allows BM ASCs to accumulate. Short-lived ASCs typically divide in the extrafollicular space of lymphoid organs (38). In WT-challenged mice, the transient elevation in IgM+ ASCs suggests that SpA induces short-lived cells that cannot survive long-term in the BM. To assess this, we analyzed spleen sections on day 40 (day 5 postchallenge); compared with Δspa-challenged mice, WT-challenged mice induced larger and more frequent extrafollicular foci composed of IgM+/bright cells (Fig. 4A). These foci were located in the splenic red pulp (Fig. 4A, arrows) and the bridging channels adjacent to B cell follicles (Fig. 4A, asterisks). The expansion of extrafollicular foci coincided with a significant increase in the frequency of DCs producing IL-12, a cytokine that promotes ASC differentiation (59, 60) (Supplemental Fig. 3F). It is possible that the expansion of short-lived extrafollicular ASCs occurs at the expense of GC formation (53, 61). This could reduce the pool of ASCs selected for long-term survival in the BM because post-GC PCs likely have a selective advantage once they reach the BM (62). We found that, at the peak of the ASC response, the frequency of GC B cells was not reduced in WT-challenged mice compared with Δspa-challenged mice (Fig. 4B). Instead, mice challenged with WT S. aureus produced GC B cells at higher frequencies than did those challenged with Δspa, and both groups displayed similar GC kinetics as the secondary response resolved (Supplemental Fig. 4A). By microscopy, we observed that GC structures of similar sizes were formed after Δspa and WT challenge at similar frequencies (Supplemental Fig. 4B, data not shown). Thus, the diminished number of BM ASCs following WT challenge was not caused by a GC defect. The inability of ASCs to accumulate in the BM following WT challenge (Fig. 1B) could be due to defective migration, the death of ASCs in the BM, or a lack of ASC proliferation in the BM. ASCs arrive in the BM at similar frequencies between days 40 and 45, regardless of whether SpA is expressed during challenge (Fig. 1B), and migration toward CXCL12 and expression of CXCR4 were not affected by SpA (Supplemental Fig. 1E, 1F). Thus, the inability of WT-challenged mice to accumulate BM ASCs could be due to an inhospitable BM niche. Systemic inflammation depletes BM niche factors like eosinophils and APRIL that are required for LLPC survival (29, 57, 63), so we assessed whether ASCs with specificity other than S. aureus could populate the BM during WT or Δspa S. aureus inoculation. We immunized mice with NP-KLH and 35 d later boosted with NP-KLH alone or boosted and coinfected (i.v.) with S. aureus RN4220 WT or Δspa. We detected similar numbers of NP-specific IgG ASCs in the BM on day 49 (day 14 postboost), regardless of whether mice were coinfected with S. aureus WT or Δspa (Fig. 5A). This suggests that i.v. inoculation with WT S. aureus does not disrupt the competence of the BM to support ASCs. In support of this, we found that the frequencies of eosinophils and APRIL+ BM cells were similar between WT- and Δspa-challenged mice (Fig. 5B, 5C). These data suggest that the defect in ASC accumulation after WT S. aureus challenge was not caused by a disruption in the BM niche environment, but by an alteration intrinsic to the ASC population. To determine which cell-intrinsic characteristics were responsible for the lack of accumulation of ASCs in the BM, we measured cell surface expression of the receptors on ASCs that detect BM niche factors: TACI, BCMA, and CD138 (28, 64, 65). Although ASCs from Δspa- and WT-challenged mice displayed similar levels of TACI and BCMA between days 10 and 12 postchallenge (days 45 and 47) (Supplemental Fig. 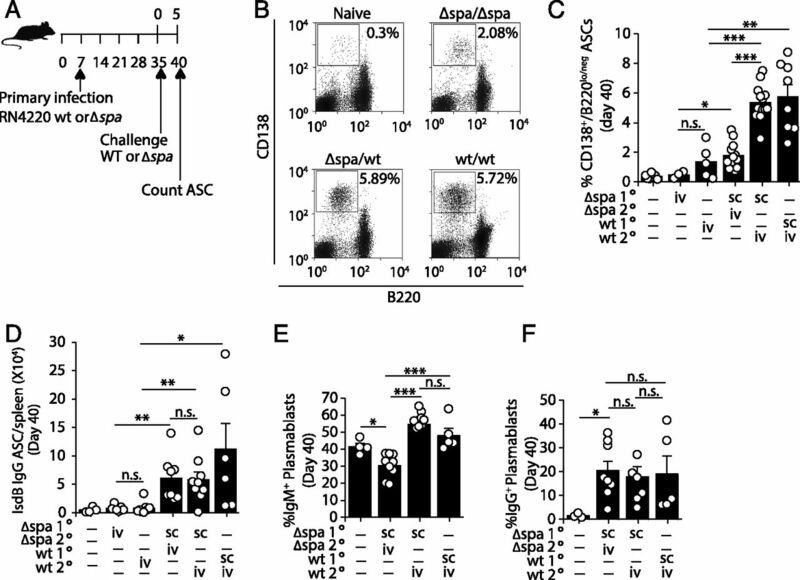 4C, 4D), ASCs from Δspa-challenged mice expressed significantly higher levels of CD138, a maturation marker and receptor for APRIL (Fig. 5D). Although APRIL levels in BM cells were unaffected by SpA (Fig. 5C), the diminished expression of CD138 might limit the ability of ASCs (formed after WT challenge) to detect APRIL, a niche factor that provides proliferation and survival signals in the BM niche. ASCs that migrate to the BM must proliferate to fill the BM niche and compete for survival factors necessary to become LLPCs (27). To determine whether these requirements were defective in ASCs from WT-challenged mice, we measured the frequencies of dividing and apoptotic ASCs in the BM between days 10 and 12 postchallenge. Similar frequencies of ASCs from WT- and Δspa-challenged mice expressed the apoptotic marker annexin V (Supplemental Fig. 4E), suggesting that cell death is not responsible for the inability of ASCs to become LLPCs in the BM of WT-challenged mice. To assess proliferation of BM ASCs, we injected mice i.p. with BrdU on day 10 postchallenge (day 45). After 2 h, we examined BM ASCs and found that more ASCs from Δspa-challenged mice had incorporated BrdU compared with ASCs from WT-challenged mice, indicating that more cells had undergone DNA synthesis (Fig. 5E). Thus, after their arrival in the BM, ASCs that formed in the presence of SpA are defective in their ability to proliferate, which may prevent them from occupying the BM niche. To test the long-term impact of diminished proliferation after WT challenge and to confirm that ASCs were not simply delayed in arriving in the BM, we measured IsdB-specific ASCs 8 wk after challenge (day 91). BM ASCs induced by Δspa challenge were maintained for 8 wk, indicating that they had established a pool of LLPCs; however, the low numbers of ASCs present 2 wk after WT challenge (day 49) remained unchanged at 8 wk postchallenge (Fig. 6A). Although BM is the main site of LLPC survival, the spleen also harbors PCs for a significant period of time (66). We examined whether expanded ASCs induced by WT challenge could persist in the spleen over time. The numbers of ASCs present in the spleen declined in both WT- and Δspa-challenged mice by week 8 postchallenge to levels that were not different from those in naive mice (Fig. 6B). This indicates that WT challenge did not establish LLPCs in the spleen. The function of LLPCs is to maintain Ag-specific Abs for long periods of time as an early defense during re-exposure to pathogens (31, 32). We observed that, in the short-term, the S. aureus–specific IgG responses in the first 2 wk after challenge with WT or Δspa were similar (Fig. 2). Because we could not detect significant numbers of Ag-specific BM ASCs in WT-challenged mice, we hypothesized that this Ab response would not be maintained beyond 2 wk. To test this, we measured serum IgG in groups of WT- or Δspa-challenged mice biweekly for 12 wk after challenge. 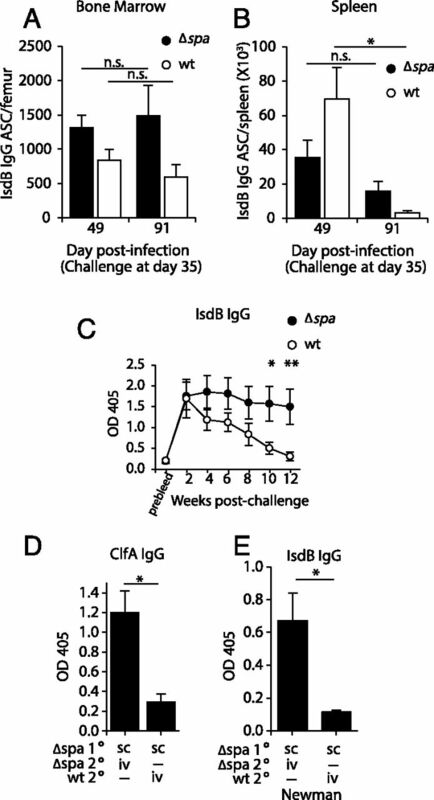 We found that, by 4 wk postchallenge, the levels of IsdB-specific IgG diverged; mice challenged with Δspa S. aureus maintained relatively high serum Ab for the 12-wk period, whereas the serum Ab levels in mice challenged with WT S. aureus dropped to levels detected in uninfected mice (Fig. 6C). We observed a similar divergence in the Ab response to a different S. aureus protein, ClfA, at 12 wk postchallenge (Fig. 6D), as well as in mice infected and challenged with Newman strains (Fig. 6E). This drop in Ag-specific Ab is consistent with the decreased frequency of Ag-specific ASCs in the BM (Fig. 1B). Importantly, the differences in Ab production that we observed between WT- and Δspa-challenged mice at 10 and 12 wk postchallenge were not due to differences present early in the secondary response. 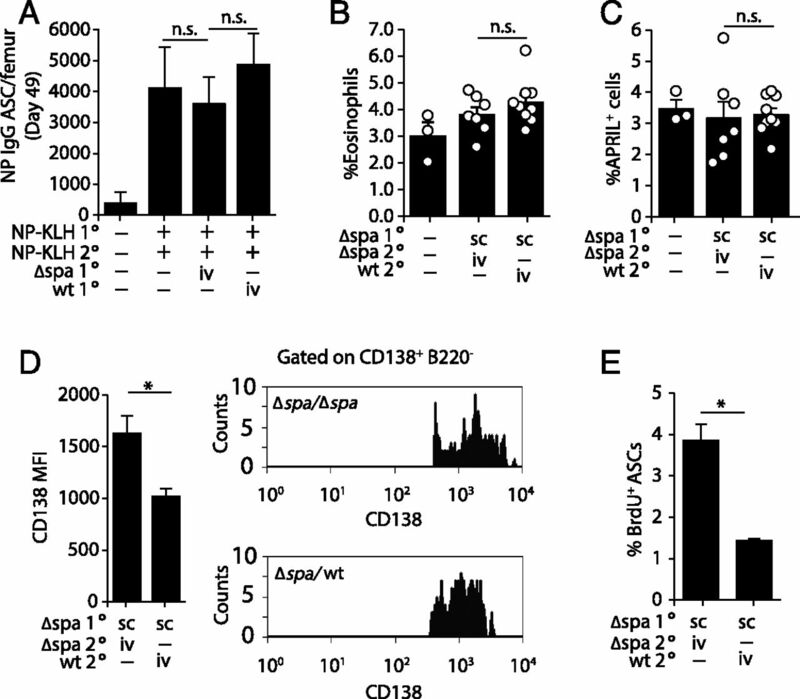 Therefore, although the presence of SpA during a challenge inoculation does not disrupt the formation of memory B cells and secondary ASC responses, it impairs the accumulation of BM ASCs coincident with decreasing proliferation and expression of CD138 and prevented long-term maintenance of Ag-specific serum IgG. S. aureus infections commonly recur without inducing protective immunity. Whether this relates to an inability to form or activate memory B cells or to defects in establishing LLPCs in the BM has remained unclear. In this study, we show that SpA caused short-lived extrafollicular PBs to expand and dominate the secondary humoral response within the spleen. In addition, the expression of SpA during challenge infection diminishes the proliferation of ASCs that enter the BM, thereby decreasing the LLPC pool and, consequently, long-term Ab production. These findings identify a previously unappreciated mechanism by which SpA disrupts the formation of LLPCs, a critical event in sustaining Ab titers. Our findings demonstrate a reciprocal relationship between short-lived ASCs and LLPCs. In cases of infection, chronic Ag exposure promotes splenic short-lived ASC proliferation over BM PCs by altering chemokine production and responsiveness (57). Similarly, in a model of systemic lupus erythematosus, chronic availability of autoantigen disrupts the responsiveness of splenic ASCs to CXCL12, coincident with an inability of diseased mice to generate BM PCs (66). Our study shows that migration and homing of ASCs to the BM were normal following S. aureus infection, suggesting that the mechanism that links splenic ASC expansion to reduced LLPC numbers in S. aureus infection is unique. Expanded numbers of splenic ASCs and reduced numbers of BM PCs are also evident in immunized Fcγ−/− mice (60). This phenotype is accompanied by an increase in the numbers of IL-12+ DCs. IL-12 was demonstrated to enhance T-independent B cell responses (59). Because the frequency of IL-12–producing DCs is increased after WT challenge, but not Δspa challenge, it is possible that SpA-induced IL-12 may enhance T-independent B cell responses during S. aureus infection. For example, during challenge infection with WT S. aureus, the ability of SpA to bind Fc regions of IgG might impede immune complex–FcγR interactions. The absence of FcγR activation would result in a net increase in DCs producing IL-12 in response to TLR ligands on S. aureus (60, 67, 68). In turn, this would induce a preference toward short-lived extrafollicular ASCs over LLPCs. The altered fate of LLPCs after challenge with SpA+ S. aureus may also be controlled at the level of transcription. Previous work showed that lowering the threshold of B cell activation through loss of the transcription factor Aiolos increases proliferation of short-lived splenic ASCs and diminishes the number of LLPCs in the BM, without affecting GCs, BM niche factors, or chemokine homing (69). This is much like the phenotype that we observed in mice challenged with SpA+ S. aureus. This raises the possibility that SpA ligation of the BCR might alter transcription factors involved in LLPC proliferation or survival. The ASCs formed after challenge with SpA-deficient S. aureus were more likely to proliferate upon reaching the BM (Fig. 5E). This phenotype was coincident with an increase in the levels of CD138, a marker of maturity and a receptor for the ASC survival factor APRIL (65, 70). Together, these data are consistent with a model of imprinted LLPC fate, in which some ASCs differentiating in the spleen receive BCR- or T cell–derived signals that induce a pattern of gene expression required to become a LLPC in the BM (71, 72). In this model, ASCs expanded by SpA in extrafollicular spaces (Fig. 4A) would be at a disadvantage because they may be less likely to receive T cell help. Alternatively, they may lack the appropriate BCR signals required to upregulate CD138 or other undefined receptors necessary for BM niche survival. This scenario would be similar to infection with Plasmodium chabaudi, which drives an expanded T-independent ASC response while inhibiting long-term maintenance of the T-dependent Ab response (53). The fact that most of the expanded ASCs induced by SpA were surface IgM+ may also be important if the genes expressed during formation of LLPCs are downstream of BCR signaling through IgG but not IgM (73). Another possibility is that the expanded short-lived ASCs induced by SpA occupied vital BM niches long enough that properly imprinted ASCs missed a window of opportunity to become established in the long-lived pool. There is evidence that such a window is controlled by transient expansion and activation of chemokine-producing BM niche cells (74). 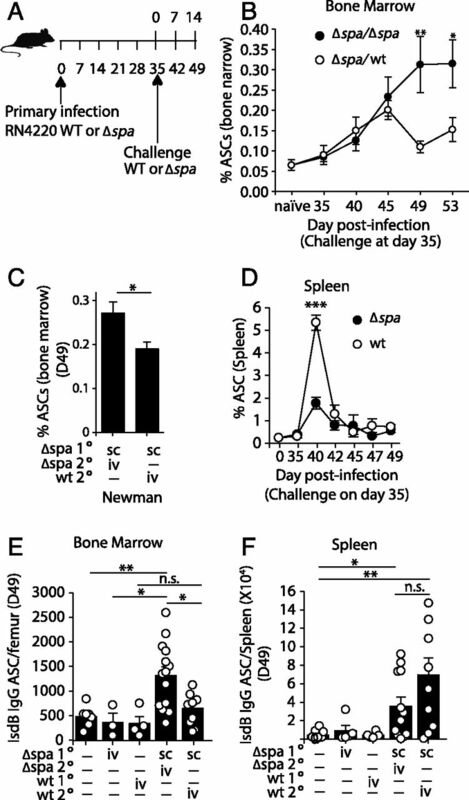 This may explain why the numbers of LLPCs in WT S. aureus–challenged mice failed to catch up to those observed in Δspa-challenged mice several weeks after the splenic ASC response resolved (Fig. 6A). Our finding that challenge with SpA+ S. aureus promotes an expansion of IgM+ PBs has two important implications. First, the expansion is not accompanied by an increase in total serum IgM or in IgM-producing IsdB-specific ASCs, consistent with previous studies showing that SpA promotes nonspecific PB proliferation without inducing Ab secretion (51). This ability of SpA to regulate IgM+ ASCs might have implications during the LLPC response because IgM–FcμR interactions are required for PC trafficking to the BM after T-dependent immunization (75). FcμR negatively regulates T cell–independent B cell responses in the spleen (75, 76). Therefore, the ability of SpA to increase IgM+ ASC numbers without an accompanying increase in secreted IgM could indirectly interfere with the establishment of the LLPC compartment. Second, the expansion of IgM+ PBs after challenge with SpA+ S. aureus suggests a significant contribution of IgM memory B cells in addition to activation of naive cells. Changes in gene expression allow memory B cells to divide more rapidly compared with naive B cells (47). Memory B cells also express higher levels of costimulatory molecules and TLRs (77). Thus, the effects of SpA may preferentially target the memory population because SpA–BCR binding increases TLR2 sensitivity, resulting in ASC proliferation without Ab production (51). In addition, SpA mediates BCR-mediated uptake of S. aureus, leading to the activation of intracellular TLRs (78). Further, IgM memory B cells are more often positioned within the marginal zone compared with IgG memory cells. Their preferred presence in the marginal zone, where exposure to soluble SpA may be enhanced, may also favor short-lived extrafollicular responses (47, 61, 79). Flow-based methods to detect S. aureus–specific memory B cells will allow future studies to discern the respective roles of memory B cell subsets in infection (80). Secondary B cell responses to SpA+ S. aureus are unable to contribute to pathogen clearance (41, 81–83). The underlying mechanisms have remained unclear; however, it was found that abscess formation is decreased when SpA is neutralized (39, 84) or when mice are first vaccinated with a mutant form of SpA that cannot bind the Fab or Fc portions of Ab (SpAkkaa) (48). These studies implicate SpA in failed protective immunity. Our study provides mechanistic evidence that SpA disrupts sustained production of Ab by preventing the accumulation of LLPCs. Although we could achieve sustained convalescent Ab levels through vaccination with SpA-deficient S. aureus, this strategy does not confer protection upon challenge with SpA-expressing S. aureus, because SpA manipulates memory responses by altering BCR-mediated responses and sequestering IgG that might otherwise participate in preventing or clearing the infection. We confirmed this by challenging previously infected mice and then rechallenging (third infection) with WT Newman S. aureus (106 CFU) 14 wk later. We found that, despite the sustained production of Ab after a second infection with SpA-deficient S. aureus, the third infection with SpA+ S. aureus resulted in bacterial organ burdens similar to those sustained by mice with no convalescent Ab (mice who received a second infection with WT S. aureus) (data not shown). This occurred despite the Ab being functional in vitro (Fig. 2H). This suggests that the convalescent levels of protective Ab are not adequate to prevent abscess formation in this model. It is important to point out that murine protection studies with S. aureus are complicated by the need to use a burden of bacteria that greatly exceeds levels found in human sepsis (typically 104–105 bacteria per milliliter of blood). Thus, it is possible that convalescent Ab in mice might be sufficient if a more physiologic bacterial burden could be used in assessing protection. Regardless of this limitation in S. aureus challenge models, our study shows that SpA impedes the continued production of Ab by preventing the accumulation of LLPCs, in addition to its earlier role in sequestering existing Ab. Thus, our data show that S. aureus infection can generate B cell memory. Despite this, the presence of SpA during a subsequent infection drives an excess of short-lived PBs that do not enhance the S. aureus–specific Ab levels but rather hinder LLPC production. These data may have implications for vaccines because they suggest that infection with SpA-expressing S. aureus can manipulate the B cell response and hinder long-lived humoral immunity, even if memory has been successfully established. It would be interesting to test the effect of the SpAkkaa vaccine on the accumulation of LLPCs and long-term Ab levels. This could provide insight into whether Abs against SpA are sufficient to attenuate the negative effects of SpA on the LLPC population during challenge infection. We thank Dr. Benfang Lei for generously supplying IsdB peptides, Dr. Alexander Horswill for sharing GFP-expressing RN4220, and Dr. Shane Crotty for kindly providing PWM and technical support. We also thank Dr. Donna Culton for thoughtful critique and help with the study design, Dr. Karen McKinnon for technical help with the experimental design, and Dr. Jessica Cisewski for statistical advice. This work was supported by National Institutes of Health Grants R01 AI070984 and R21 AI105613 (to B.J.V.). A.B.K. was supported by National Institutes of Health Grant 5 T32 AI 7273 and through the Program in Translational Medicine at the University of North Carolina at Chapel Hill by a Howard Hughes Medical Institute grant supporting the Med into Grad Initiative. The University of North Carolina Flow Cytometry Core Facility, the Microscopy Services Laboratory, and the Animal Histopathology Core are supported by a National Cancer Institute Center Core Support Grant (P30CA016086) to the University of North Carolina Lineberger Comprehensive Cancer Center.
. 2008. The impact of antimicrobial-resistant, health care-associated infections on mortality in the United States. Clin. Infect. Dis. 47: 927–930.
. 2003. Staphylococcus aureus bacteremia: recurrence and the impact of antibiotic treatment in a prospective multicenter study. Medicine (Baltimore) 82: 333–339.
. 2009. Evaluating the potential public health impact of a Staphylococcus aureus vaccine through use of population-based surveillance for invasive methicillin-resistant S. aureus disease in the United States. Vaccine 27: 5061–5068.
. 2013. Evaluation of the protective immunity of a novel subunit fusion vaccine in a murine model of systemic MRSA infection. PLoS One 8: e81212.
. 2014. Covering all the bases: preclinical development of an effective Staphylococcus aureus vaccine. Front. Immunol. 5: 109.
. 2012. Opsonic and protective properties of antibodies raised to conjugate vaccines targeting six Staphylococcus aureus antigens. PLoS One 7: e46648.
. 2012. Synthesis and evaluation of a conjugate vaccine composed of Staphylococcus aureus poly-N-acetyl-glucosamine and clumping factor A. PLoS One 7: e43813.
. 2006. Vaccine assembly from surface proteins of Staphylococcus aureus. Proc. Natl. Acad. Sci. USA 103: 16942–16947.
. 2012. Lower antibody levels to Staphylococcus aureus exotoxins are associated with sepsis in hospitalized adults with invasive S. aureus infections. J. Infect. Dis. 206: 915–923.
. 2010. Antibody responses in patients with invasive Staphylococcus aureus infections. Eur. J. Clin. Microbiol. Infect. Dis. 29: 715–725.
. 2013. A serologic correlate of protective immunity against community-onset Staphylococcus aureus infection. Clin. Infect. Dis. 56: 1554–1561.
. 2014. Release of protein A from the cell wall of Staphylococcus aureus. Proc. Natl. Acad. Sci. USA 111: 1574–1579.
. 2005. Cell surface recycling of internalized antigen permits dendritic cell priming of B cells. Immunity 23: 503–514.
. 2005. Bacterial cell wall-expressed protein A triggers supraclonal B-cell responses upon in vivo infection with Staphylococcus aureus. Microbes Infect. 7: 1501–1511.
. 2014. Staphylococcus aureus infection induces protein A-mediated immune evasion in humans. J. Exp. Med. 211: 2331–2339.
. 1993. Age-associated changes in binding of human B lymphocytes to a VH3-restricted unconventional bacterial antigen. J. Immunol. 151: 5840–5855.
. 1974. Protein A from Staphylococcus aureus: the biological significance of its reaction with IgG. Ann. N. Y. Acad. Sci. 236: 252–266.
. 1977. Effect of protein A on staphylococcal opsonization. Infect. Immun. 15: 760–764.
. 1981. The bone marrow: the major source of serum immunoglobulins, but still a neglected site of antibody formation. Clin. Exp. Immunol. 46: 1–8.
. 2013. T cell-dependent IgM memory B cells generated during bacterial infection are required for IgG responses to antigen challenge. J. Immunol. 191: 1240–1249.
. 2014. Antigen-specific memory B-cell responses to enterotoxigenic Escherichia coli infection in Bangladeshi adults. PLoS Negl. Trop. Dis. 8: e2822.
. 2003. The rise and fall of long-lived humoral immunity: terminal differentiation of plasma cells in health and disease. Immunol. Rev. 194: 61–76.
. 2002. Short-lived and long-lived bone marrow plasma cells are derived from a novel precursor population. J. Exp. Med. 195: 737–745.
. 2011. TACI deficiency impairs sustained Blimp-1 expression in B cells decreasing long-lived plasma cells in the bone marrow. Blood 118: 5832–5839.
. 2009. Transmembrane activator, calcium modulator, and cyclophilin ligand interactor drives plasma cell differentiation in LPS-activated B cells. J. Allergy Clin. Immunol. 123: 1277–86.e5.
. 2011. Contributions of humoral and cellular immunity to vaccine-induced protection in humans. Virology 411: 206–215.
. 2013. What is and what should always have been: long-lived plasma cells induced by T cell-independent antigens. J. Immunol. 190: 5913–5918.
. 2015. Long-lived plasma cells are contained within the CD19(−)CD38(hi)CD138(+) subset in human bone marrow. Immunity 43: 132–145.
. 2006. The nitrosative stress response of Staphylococcus aureus is required for resistance to innate immunity. Mol. Microbiol. 61: 927–939.
. 2012. Receptor cross-talk spatially restricts p-ERK during TLR4 stimulation of autoreactive B cells. J. Immunol. 189: 3859–3868.
. 1996. The phenotype and fate of the antibody-forming cells of the splenic foci. Eur. J. Immunol. 26: 444–448.
. 2013. Role of protein A in the evasion of host adaptive immune responses by Staphylococcus aureus. MBio 4: e00575-13.
. 2013. Effect of an investigational vaccine for preventing Staphylococcus aureus infections after cardiothoracic surgery: a randomized trial. JAMA 309: 1368–1378.
. 2013. Irradiated wild-type and Spa mutant Staphylococcus aureus induce anti-S. aureus immune responses in mice which do not protect against subsequent intravenous challenge. Pathog. Dis. 68: 20–26.
. 2011. Identifying protective antigens of Staphylococcus aureus, a pathogen that suppresses host immune responses. FASEB J. 25: 3605–3612.
. 2005. Early appearance of germinal center-derived memory B cells and plasma cells in blood after primary immunization. J. Exp. Med. 201: 545–554.
. 2011. How T cells earn the follicular rite of passage. Immunity 35: 671–680.
. 2009. Memory B cells: effectors of long-lived immune responses. Eur. J. Immunol. 39: 2065–2075.
. 2010. Nontoxigenic protein A vaccine for methicillin-resistant Staphylococcus aureus infections in mice. J. Exp. Med. 207: 1863–1870.
. 2000. A B cell superantigen-induced persistent “Hole” in the B-1 repertoire. J. Exp. Med. 192: 87–98.
. 1995. VH3 family antibodies bind domain D of staphylococcal protein A. J. Immunol. 154: 6437–6445.
. 2007. Staphylococcus aureus protein A triggers T cell-independent B cell proliferation by sensitizing B cells for TLR2 ligands. J. Immunol. 178: 2803–2812.
. 2002. Protein A is a virulence factor in Staphylococcus aureus arthritis and septic death. Microb. Pathog. 33: 239–249.
. 2013. Acute Plasmodium chabaudi infection dampens humoral responses to a secondary T-dependent antigen but enhances responses to a secondary T-independent antigen. J. Immunol. 191: 4731–4739.
. 2013. Persistent autoantibody-production by intermediates between short-and long-lived plasma cells in inflamed lymph nodes of experimental epidermolysis bullosa acquisita. PLoS One 8: e83631.
. 2011. Interferon-α induces unabated production of short-lived plasma cells in pre-autoimmune lupus-prone (NZB×NZW)F1 mice but not in BALB/c mice. Eur. J. Immunol. 41: 863–872.
. 2013. Plasma cell homeostasis: the effects of chronic antigen stimulation and inflammation. J. Immunol. 191: 3128–3138.
. 2013. Experimental sepsis impairs humoral memory in mice. PLoS One 8: e81752.
. 1998. IL-12 enhances antibody responses to T-independent polysaccharide vaccines in the absence of T and NK cells. J. Immunol. 161: 5525–5533.
. 1995. Soluble antigen can impede affinity maturation and the germinal center reaction but enhance extrafollicular immunoglobulin production. J. Immunol. 155: 1141–1150.
. 2005. Identification of proteoglycans as the APRIL-specific binding partners. J. Exp. Med. 201: 1375–1383.
. 2003. A genetic lesion that arrests plasma cell homing to the bone marrow. Proc. Natl. Acad. Sci. USA 100: 12905–12910.
. 2006. Translating innate immunity into immunological memory: implications for vaccine development. Cell 124: 849–863.
. 2011. T and B cells are not required for clearing Staphylococcus aureus in systemic infection despite a strong TLR2-MyD88-dependent T cell activation. J. Immunol. 186: 443–452.
. 2004. Aiolos is required for the generation of high affinity bone marrow plasma cells responsible for long-term immunity. J. Exp. Med. 199: 209–219.
. 2011. Distinct phenotypes of plasma cells in spleen and bone marrow of autoimmune NOD.B10.H2b mice. Autoimmunity 44: 415–426.
. 2014. Adjuvant-specific regulation of long-term antibody responses by ZBTB20. J. Exp. Med. 211: 841–856.
. 2002. A distinct signaling pathway used by the IgG-containing B cell antigen receptor. Science 298: 2392–2395.
. 2013. The establishment of the plasma cell survival niche in the bone marrow. Immunol. Rev. 251: 177–188.
. 2009. Resting human memory B cells are intrinsically programmed for enhanced survival and responsiveness to diverse stimuli compared to naive B cells. J. Immunol. 182: 890–901.
. 2013. Pathogen-triggered activation of plasmacytoid dendritic cells induces IL-10-producing B cells in response to Staphylococcus aureus. J. Immunol. 190: 1591–1602.
. 2010. Preferential localization of IgG memory B cells adjacent to contracted germinal centers. Proc. Natl. Acad. Sci. USA 107: 12192–12197. 2008. The antifungal vaccine derived from the recombinant N terminus of Als3p protects mice against the bacterium Staphylococcus aureus. Infect. Immun. 76: 4574–4580.
. 2012. Immunization with Staphylococcus aureus iron regulated surface determinant B (IsdB) confers protection via Th17/IL17 pathway in a murine sepsis model. Hum. Vaccin. Immunother. 8: 336–346.
. 2014. Immune control of Staphylococcus aureus - regulation and counter-regulation of the adaptive immune response. Int. J. Med. Microbiol. 304: 204–214.
. 2012. Protein A-specific monoclonal antibodies and prevention of Staphylococcus aureus disease in mice. Infect. Immun. 80: 3460–3470.